Formed from the Pecos, Kinney, and Crockett counties, Val Verde officially became a county in 1885, and is 3,242 square miles in area (which is three times the size of Rhode Island). Election records from that year show that Langtry citizen Roy Bean was elected to serve as Justice of the Peace. Legend has it that Bean so greatly admired the English actress Lillie Langtry that he took her last name for the name of his town, and he named his saloon after her nickname, "Jersey Lily". Unfortunately, a sign painter misspelled "Lily" and the sign still reads "The Jersey Lilly". Upon his election as JP, he used his saloon as a combination bar-courtroom-billiard parlor-jail. 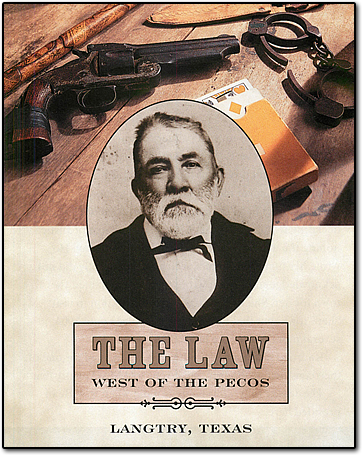 People came to regard Judge Roy Bean as "The Law West of the Pecos" because he dispensed his own unique brand of justice from the Jersey Lily Saloon. Although this kept him constantly in "hot water" with Val Verde County officials, it formed the basis for the legends that grew up around him. Judge Roy Bean was to later become the subject of books, movies and a television series due to the notoriety he earned during his tenure as JP. One of the more interesting events occurring in Langtry during Judge Bean's tenure was the world championship prize fight between Australia's Bob Fitzsimmons and Ireland's Peter Mahar. To avoid rulings from the United States and Mexico against the fight, Bean held it on a sand bar in the middle of the Rio Grande in February, 1896. Fitzsimmons won by a knockout in one minute, 35 seconds! Bean remained "The Law West of the Pecos" until his death in 1904. He was buried in Westlawn Cemetery in Del Rio. His son, Sam, was killed three years later and was buried beside his father. They remained there until 1964 when a surviving relative gave permission to move the graves onto the grounds of the Whitehead Memorial Museum in Del Rio. Click here for information on the Judge Roy Bean Visitor Center.